Classics concerts "Masters of Classics" at St. Kajetán Church are truly unforgettable for their atmosphere combining noble space with temple music. Enjoy organ music with soprano singer. Mysterious church of St. Kajetán is situated on Nerudova Street in Prague lower Castle. Nerudova Street is the part of the Royal Route. The Route is the tracks of the coronation processions. St. Kajetan Church was consecrated in 1717. A. Dvořák: Biblical song 4. and 10. Whole name of church is "Church of Our Lady of Divine Providence and Saint Kajetán. Mysterious church of St. Kajetán on Nerudova Street is valuable example of early Baroque architecture. First-rate organ concerts také place here. The church was build for the order of Theatines, and for centuries it enjoyed great popularity among the religious people. The church served its religious purposes also in the era of communism which harshly suppressed most religiousactivities. 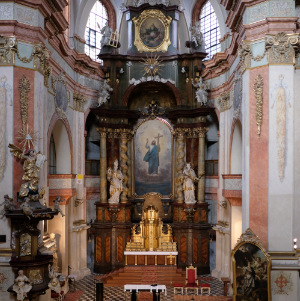 For its artistic and architectural value the church of St. Kajetán is a part of Czech National Heritage. Valuable interior was made by sculptors M.V. Jäckel and J.O. Mayer and by painter F.X. Balk, m.V. Hawlasch, J.V. Callot F. Rothmayer.